After their complete restoration, our pair of Altec Lansing Model 14s were finally ready to be auditioned . We placed them on stands so that the top of the cabinets were at ear level. (This was determined to be the best height during setup testing.) They were set 10′ apart (center to center), 3′ feet from the side walls, 28″ from the the rear wall, with a toe-in of 4″ (measured from the wall to the outside corner), and tilted up 4 degrees. Connections were made to our standard Bryston 4B-ST amplifier using 12 AWG Belden cables. Our attention was immediately drawn once again to the poor low frequency response, so we moved them back against the wall in an attempt to improve it. While bass did improve slightly, it was far from where it needed to be for overall balance of tonality. The 14s were then returned to the 28″ placement, and a pair of quick disconnect L-pads were installed to reduce the output of the horns in hopes that the low frequency driver would balance out. At this point we realized that anything in excess of a -1 dB decrease in the horn caused the lower mid-range to become overly warm. The L-pads were then removed and we brought two JBL studio subs online and crossed the Altecs at 85 Hz with a 12 dB slope at 0 degrees phase. It was a magical moment. 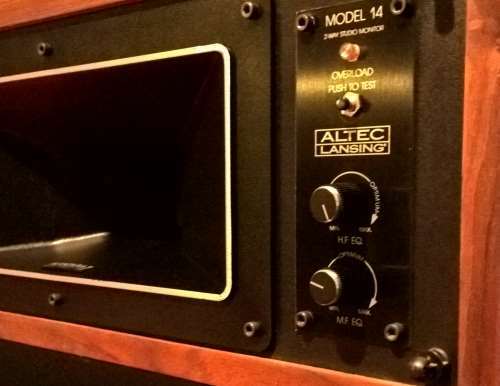 The Altecs began to sound more like professional monitors. It appears that their lack of deep bass response is a design compromise related to the natural roll off of the woofer around 1.5 kHz, and the decision to simply vent the cabinet as opposed to porting it. This allowed for a simpler crossover network, and the large 12″ woofer to operate higher beyond 1 kHz. 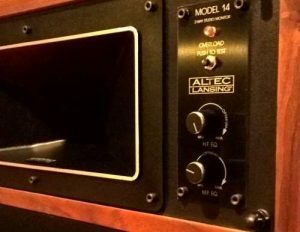 Perhaps Altec intended that the Model 14 be used along with their LF-1 or LF-2 subwoofer systems? Next, we began to adjust the horn equalization via the high and mid frequency controls on the Altec’s crossover module. In our well damped room the high frequency control needed to be set fully clockwise which corresponded to Altec’s recommended setting. The same was not true of the mid-range control, which Altec recommended be set to the 12 o’clock position. After several vocal tests it was determined that to avoid overly forward mid frequencies a setting at 9: 30 was required. The tonal quality was improving with each adjustment, but it still wasn’t quite right. While we had originally tilted them up 4 degrees to point the compression driver output line directly at ear level, this had an adverse effect on the lower mid-range. We removed the tilting wedge and set the Model 14 level on the stands. Tonal balance improved yet again. We then turned our attention to the stereophonic imaging of the system. After testing several different toe-ins, it was determined that the best imaging was achieved at 5″ (measured from the wall to the outside corner). When you begin serious listening the first thing that immediately draws your attention are the width and depth of the sound stage created by the Altecs. It’s impressive. Secondly, the transient response is not only excellent, but almost perfectly controlled. (A rare quality in older horn based systems.) The beaming we had noticed in earlier Altec designs was non-existent. The Mantaray Constant Directivity horns worked as advertised. One rather unique attribute of the Altecs was how they sounded good at both normal and background listening levels. Their big sound stage makes lower listening levels better than any system we’ve tested. The only noticeable weaknesses in the system we attributed to the crossover and equalization circuit design. The woofer is a pass-through that’s allowed to naturally roll-off. This resulted in some warmth in the mid-range. At the other end of the frequency spectrum we didn’t like the high frequency attenuation caused by the equalization circuit. It caused the high frequencies to seem somewhat rolled off during more subtle passages of music, but as amplitude rose it balanced out. Both of these issues were minor, but noticeable. In Part 4 of this series we’ll be bi-amping the Model 14s with a dbx DriveRack PA2. It’s going to get really interesting. Continue on to Part 4.